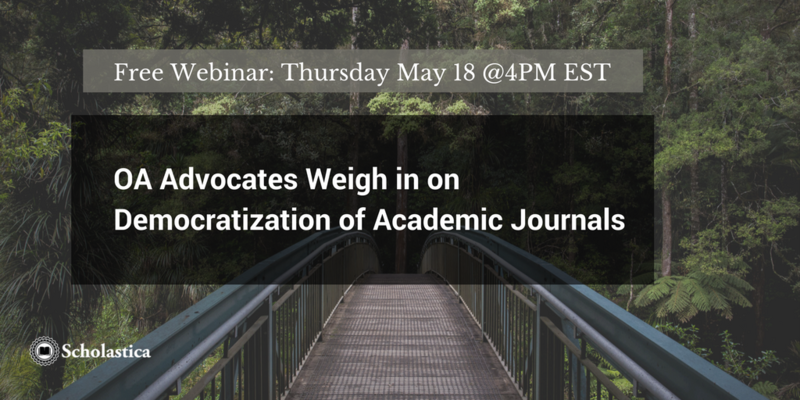 Thursday, May 18th 2017 at 4PM EST Scholastica is hosting a free webinar, “OA Advocates Weigh in on Democratization of Academic Journals.” Click here to save your spot! We’re sending all registrants the recording after the live webinar. Support for open access (OA) journal publishing is gaining fast, but there are still some unresolved questions to consider. Chief among them - how can we make a smooth transition to OA and ensure OA publishing models are sustainable? Open access journals are much more affordable to produce than traditional print publications but not entirely without cost to the academic institutions that primarily fund research. With article processing charges (APCs), often used to pay for OA article production, increasing by 6% in the past few years there is concern that some OA journals aren’t being managed as efficiently as possible and that if left unchecked APCs could become out of hand. In the transition from subscription-based journals to OA, while trying to shoulder rising OA costs along with journal subscription fee spikes, many institutions are scraping the bottom of the barrel for journal funding. The need for more affordable OA models is becoming urgent. On Thursday May 18 at 4PM EST Scholastica is hosting a free webinar to address the issues at hand - “OA Advocates Weigh in on Democratization of Academic Journals.” During this panel-style event 3 expert open access advocates will deliberate what’s needed to make open access journal publishing financially and structurally sustainable. Click here to save your spot! If you can’t make the webinar time, register anyway! Everyone who registers will get a link to the recording. The webinar discussion will be a follow up to Scholastica’s white paper “Democratizing Academic Journals: Technology, Services, and Open Access,” which explores how centralization of academic journals led to the serials crisis and argues that democratizing digital journal publishing using services is the key to fixing it. During the webinar Morgan, Missingham, and Harnad, who all served as contributors to the white paper, will share their personal viewpoints on the topic of OA sustainability. Our goal for this webinar is to bolster ongoing dialogue around the need to develop sound OA publishing models that the academic community can continually support. We’ll be seeking thoughts and questions from the audience throughout the presentation via Twitter. The webinar will end with an audience Q&A during which panelists will respond to audience questions. To participate just tweet your question with the hashtag #SustainableOA! By bringing together the perspectives of journal editors, publishers, and librarians this webinar will offer a holistic survey of the current OA publishing landscape. Additionally it will offer a deep dive into next steps to continue progressing away from subscription journals to affordable OA publishing models. We encourage you to check out Scholastica’s free-to-read white paper, which the webinar is based off of, “Democratizing Academic Journals: Technology, Services, and Open Access.” Click here to get your copy.